Three Bad Mice: Skyscrapers, Scarfs & Sambag - Lily & Lionel do HK! Skyscrapers, Scarfs & Sambag - Lily & Lionel do HK! New York's is pretty impressive, Shanghai's isn't bad either, but I challenge anyone to disagree that Hong Kong is the proud owner of the most jaw droppingly awesome skyline in all of the world. Whenever I catch myself whining about stifling humidity, my matchbox sized flat or the maddeningly slow pace at which Hong Kongers walk, I only have to take a quick hike up to the top of Victoria Peak and gaze down on the skyscrapered harbour front to remember exactly why I love this little corner of Asia. This limited edition beauty is available for HK$1,600 from the first HK outpost of Australian fashion boutique, Sambag. Get in there quick though, I got my name on the waiting list back in December and I hear that the stock that dropped last week is selling out super fast. 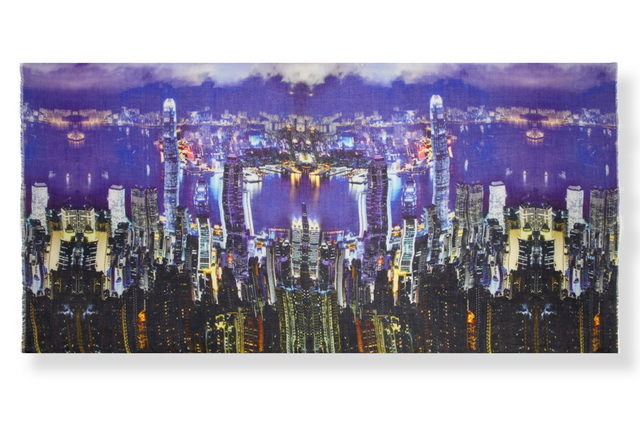 For anyone who isn't lucky enough to live within swooning distance of the real life skyline, panic not, you can still get your hands on a slice of HK scarf perfection via Matches (£100).